The temperature plummeted overnight and in the morning there was ice all over the tent. Temperature differences in the desert are mind boggling! We had a slow start before shuffling off in the cold sun on a dirt road through pinyon-juniper to Willis Creek trailhead. Although only a dirt road the panoramic views in the clear air to horizons lined with crisp new snow were superb. 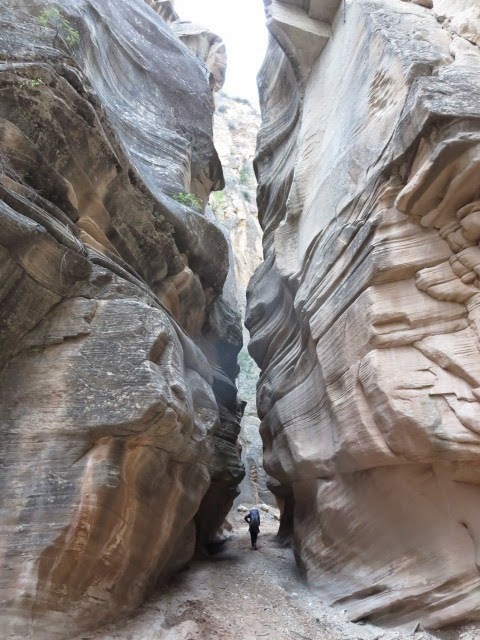 At Willis Creek we headed down the mellow canyon eastward back to the main Hayduke route in Sheep Creek. The sun started warming us and we stopped to dry out the tent and sleeping gear soaking up the warm rays. Hiking up Sheep Creek the canyon opened up but the clear post rainstorm air made everything look lovely this morning. We soon hit jeep trails and roads and headed north to the town of Cannonville. We had left a food package for ourselves here a few days ago and were happy to collect that and book into the motel here for a night. There was a grocery at the motel and the nearby KOA campground had a great selection of Uinta brewery beers – enough for us to have a veggie Mexican meal outside the motel! 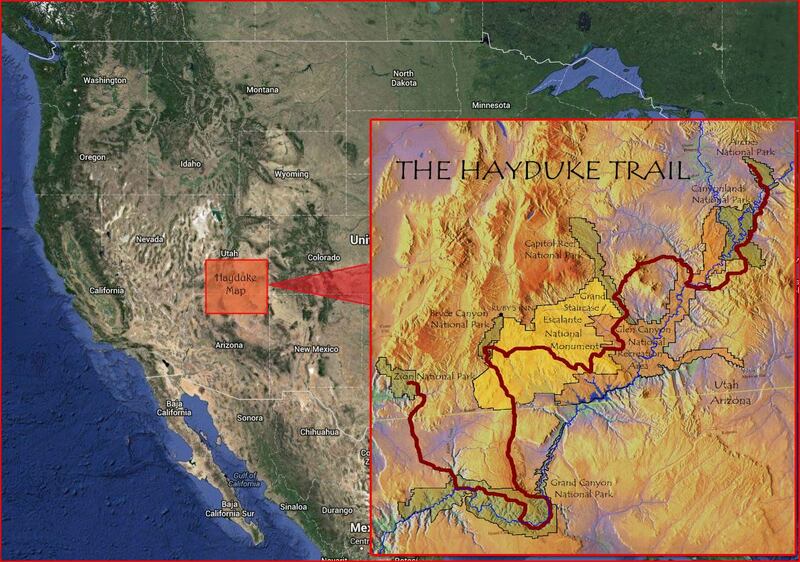 The official Hayduke route bypasses Bryce Canyon National Park (or at least the most famous part of it) so we decided to continue north and west into the park on a longer alternate. A jeep track led from the town of Tropic to the National Park and then we were on trails from there. Bryce looked like NOTHING else on this planet! 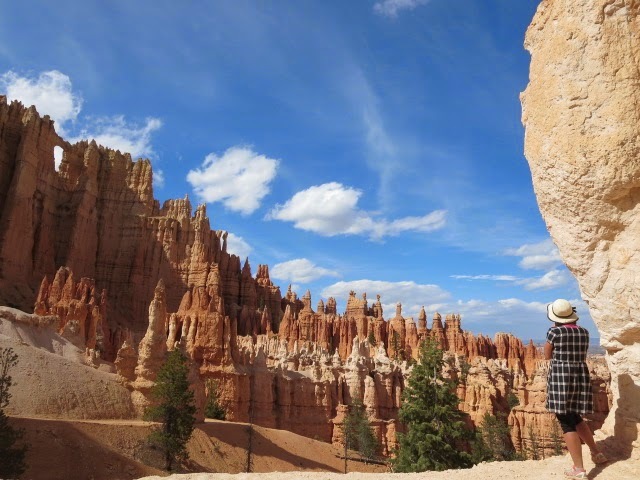 We followed the Queens Garden trail up through the magical ‘hoodoos’ (pinnacles of rock) onto the rim of the escarpment to where there is road access and lots and lots of people. After meandering around a national park campsite that is designed for cars and not hikers we eventually were able to book into the campsite and have some food outside the little grocery store cafe nearby. 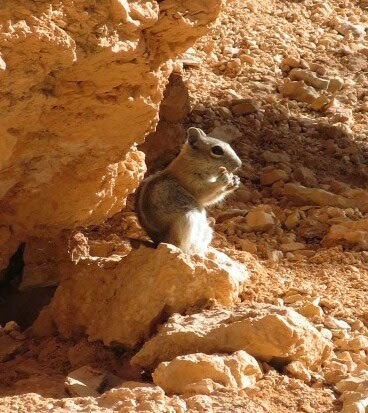 Later on in the day we followed some more scenic park trails – the Navajo and Peek-a-boo. The crowds died down into the evening but the light was lower and the hoodoos looked even more vivid. Back to the tent and the luxury of a picnic table for a late dinner plus beers, biscuits, peanuts and crisps- great! A mild complication of being in the national park was that there is a rule that we need to have bear canisters to protect our food when backcountry camping. Unfortunately we don’t have a means of getting a canister or if we did, returning it back, as we will be hiking south from here. We could have arranged to camp outside the park boundary – where the rules don’t apply – but we were not sure if the bears will conform to the rules though! But instead we decide to hike south from the park center where we are camped with daypacks and hitch back at the end of the day to the same campsite. Then hitch out the next day to carry on hiking where we will be able to camp the next night outside the park. First though we had a luxury breakfast at our picnic table with real milk, yogurt and grapefruits. A nice couple from Michigan parked next to us gave us the grapefruits. They are ‘snow birds’ who have spent 6 winter months in Arizona’s ‘Sun City’ before travelling back to spend the summer in Michigan. 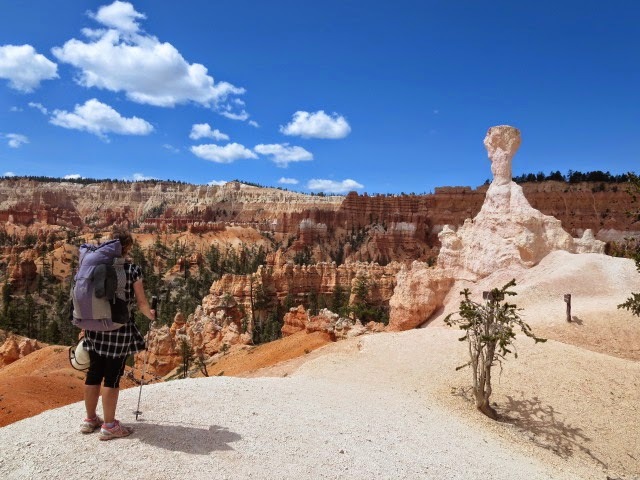 We set off with light backpacks along the Bryce canyon rim to Bryce point which has a wonderful panoramic view of the hoodoos. 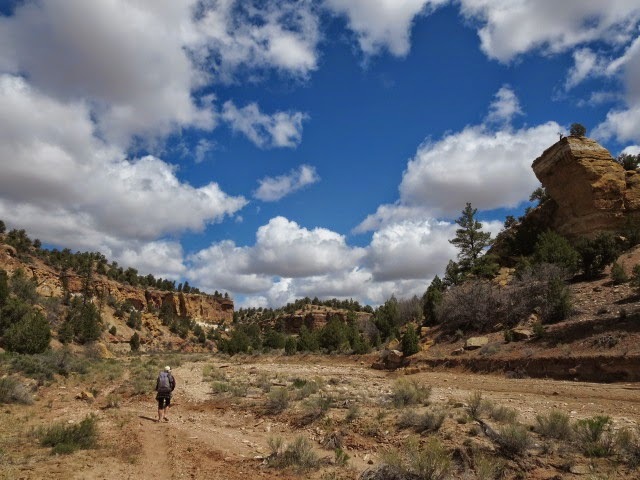 We then descended a wonderful trail through colorful clay and gravel beds onto the ‘Under the rim’ trail, soon reaching an area called the ‘Hat Shop’ -lots of pinnacles at the cliff edge with limestone boulders perched on top. The trail was excellent, reminiscent of the Pacific Crest Trail in southern California. 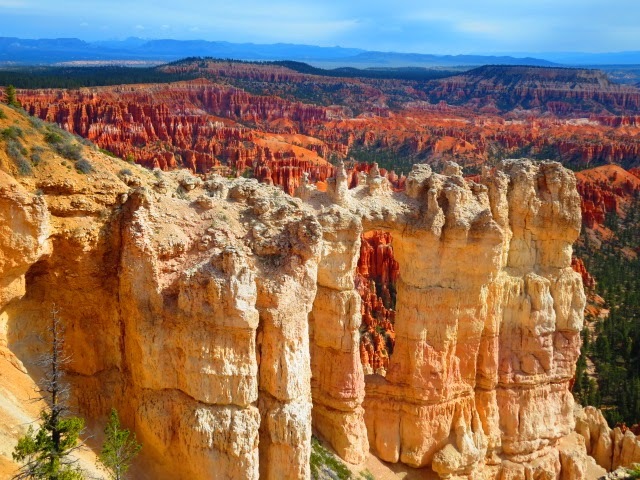 Lots of ups and downs, zig-zagging over ridges extending out from the pink cliffs of the rim edge. And then looking up to the escarpment it was like a better version of the Continental Divide Trail’s ‘Bob Marshall Wilderness’ section. Anyway – it was great! Eventually we pull off the trail to climb up the escarpment to the park road. We hoped to catch a shuttle bus here back to the campsite but none appeared so hitching was required! We lucked out and got a great ride back from another Michigan couple in the back of their pickup truck. Around 10pm a storm came through. We were at 9,000 feet here and we got dumped on by a huge amount of snow through the night along with gale force winds! 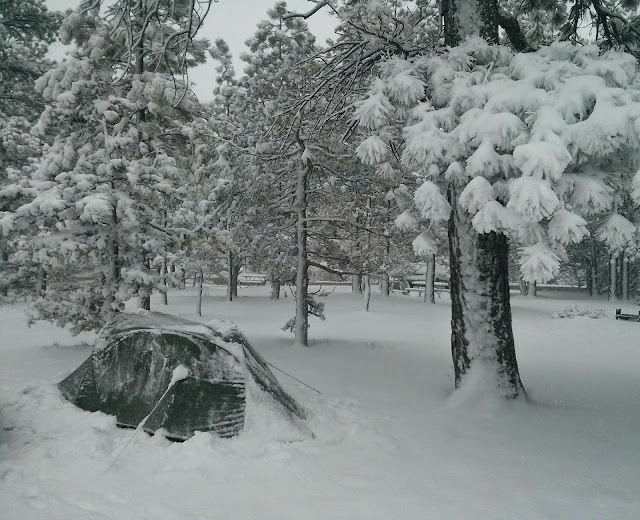 Our tent was sheltered to an extent in the tall ponderosa pines- but Martina spent most of the night shaking the tent to free it of snow- Brian slept through! We beat a retreat in the morning back to the park visitor centre then caught a bus 3 or 4 miles down to the town of Ruby’s Inn where we dried out in a motel.